How good you do in this slot machine solely depends on how good you do in the “gamble feature.” I was able to stay even, or just about even, for long periods of time by doing well on the gamble feature. When I decided to give the gamble feature up all together, I started losing money. I didn’t’ start to lose money too fast, but there were definitely noticeable dents in my balance. The payouts are some what small, but since the max bet is only 45.00 the payouts are actually not that bad. You end up winning a lot of pay lines that don’t pay out more than you bet (the one that you win the most is the 25.00 one) but you still have your shots at the 100 – 300 payouts, and if you do good on the gamble feature you can turn those 25.00 winners into 50.00 or more. There is no wild symbol in this game and if it had one it would be an elite slot machine. The scatter symbol is the bonus trigger. 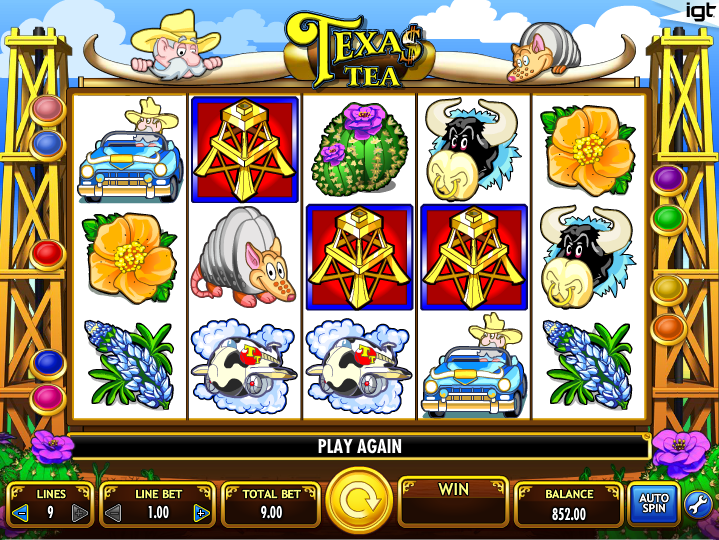 It’s the picture of a cowboy with a cigar in his mouth which the game nicknames “Texas Ted.” Three scatter symbols positioned anywhere on the reels start the “oil dividend” bonus. The “gamble” feature bonus is available on this slot machine. After each winning of under 3,000, you have the choice to pick a color of a playing card. If you choose correctly your winnings double, but if you choose the wrong color then you lose all of it. The better of the other two bonuses is the “big oil bonus.” To get this you have to get three or more oil rig symbols to line up in the first three or more reels. The game then takes you to a screen that has a picture of Texas on it, where you pick “counties” of the state and each county has different winnings. The other bonus is the “oil dividend” bonus. To get this you have to get three or more scatter symbols. The game will then take you to a screen where “Texas Ted” writes you a check. The check amount depends highly on how many scatter symbols actually triggered the bonus – the more the better. This game is a decent one. You really do have to do well on the gamble bonus if you would like to make any kind of money on it. If you are doing bad on the gamble feature or aren’t playing it at all, you are more than likely going to start losing money relatively quickly.